This is intended to be a calculator for those buying on the Funding Secure secondary market. Some things are hard to account for, particularly how to price in expectations of bad debt on an annualised basis. 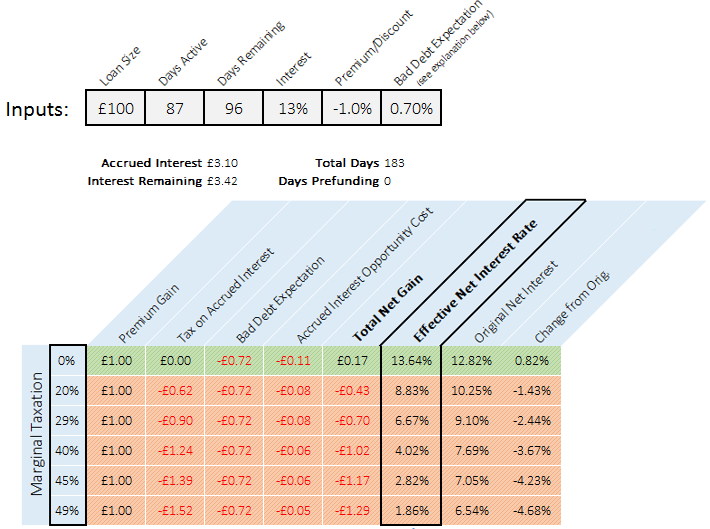 So, I’ve included a draw out of ‘Net Effective Interest Rate’ to a working breakdown that can be used to understand the calculation. You can adjust this to any custom marginal taxation too, if you’re a recent graduate earning £150k+! Original net interest rate includes deductions for taxation and bad debt expectation. Marginal tax thresholds include those paying off student loans, which can be treated like a tax for many. Above, the 29% marginal tax bracket is 20% rate + 9% student loan rate. ‘Bad Debt Expectation’ is the expectation of write off on each 6 month (183 day) loan. So, if you feel that 1.5% is a fair write-off on a yearly basis, perhaps something around 0.7% or 0.75% would be good above. If you disagree with how I’ve tried to price in bad debt, you could just put the rate as 0% to ignore its impact in the calculation and then mentally adjust afterwards. Please note this is an unofficial calculator for personal use, and has no relation to Funding Secure itself.